"Battle dress" redirects here. For other uses, see Battle dress (disambiguation). A combat uniform, field uniform, or battledress, is a type of uniform used in combat, as opposed to dress uniforms worn in functions and parades. In American English, the term fatigues is often used, originally being a term for soldiers' work uniforms. The combat uniform is generally camouflaged, either in monochrome such as a shade of green or brown to approximate the background, or in a disruptive pattern. Contrary to dress uniforms, the combat uniform is usually made from cotton (or in modern times a cotton blend), and to a more loose and comfortable cut. British forces in India in the mid 19th century were the first to use drab cotton uniforms for battle; they were first worn by the Corps of Guides in 1848 where the colour of drab light-brown uniform was called khaki by Indian troops. The first purpose-made and widely issued military camouflage fabric was for half-shelters by the Italian Army after the First World War. Germany was the first to use such shelter fabric for uniforms for their paratroopers, and by the war's end both various German as well as the older Italian fabric was widely used for camouflage uniforms. Most nations developed camouflage uniforms during the Second World War, though these were often issued only to "elite" units. Currently, Australian troops wear a camouflage uniform called Disruptive Pattern Combat Uniform (more commonly called DPCU or Auscam), shaded to suit Australia's terrain. It was developed by entering the colours of the Australian landscape into a computer program and DPCU was the result.. The Australian Army is in the process of issuing to its personnel the new Australian Multicam Camouflage Uniform (AMCU). There are three variations, the original design which is most commonly used, another for use in desert environments, called Disruptive Pattern Desert Uniform (DPDU) and a third for use by OPFOR units in training exercises. Canada's battledress developed parallel to that of the British from 1900 to 1950, though always with significant differences, and then increasingly followed the US pattern of separate uniforms for separate functions, becoming distinctively "Canadian" in the process and utilizing CADPAT design. The first true battledress adopted by Canada for standard issue across the board was the khaki field uniform known as Service Dress, adopted in 1907. This was of a separate pattern from the British Service Dress adopted after the Boer War, and marked a departure in Canadian uniforms in that it was distinct from the scarlet/blue/rifle green uniforms traditionally worn to that point, the latter of which became "ceremonial" dress for parades and other functions apart from field training. Canadian pattern Service Dress worn by Other Ranks did not stand up to the rigors of campaigning, however, and was widely replaced by British uniforms in France; some samples of Canadian pattern SD were retained in Canada, and after the war, surviving to be issued briefly in 1939. Officers wore a distinctive pattern of Service Dress (as did Warrant Officers I Class), which was identical to that worn by British officers; they were privately purchased, and of better quality than Other Ranks uniform. In combat in France and Flanders, they were often replaced on an individual basis by Other Ranks' Service Dress, making the officer less conspicuous to enemy snipers and soldiers. Khaki Drill was a series of different uniform patterns of light khaki cloth, generally cotton, first worn by Canadian soldiers in the Boer War and reserved for summer training in Canada, or for employment in tropical climates. Canada developed its own pattern after the First World War, and the uniform was commonly worn in Canada, with officers again having the option of finer garments privately purchased. In the Second World War, Canadians serving in Jamaica and Hong Kong wore Canadian pattern KD; the I Canadian Corps troops in Italy wore KD supplied in theatre by the British, generally of British, Indian or US (War Aid) manufacture. Worn in tropics far beyond 1949. KD was still in issue and worn with either short or long trousers as parade dress. Jacket was replaced with shirt for normal barrack dress wear. Worn by all British units in Kenya until Dec 1964. Also in issue and worn by British Honduras Garrison and attached Infantry Company Group until at least 1968. In 1939, the Battle Dress uniform was adopted as a field uniform; made of wool and patterned after British BD, Canadian uniforms were darker in color with a distinctive green tinge to the dark khaki color. Officers had the option of having BD tailored from better material, but in the field most wore "off the rack" BD, perhaps with a modified open collar. Service Dress was worn in 1939 and into 1940 by soldiers in Canada as field dress, and afterward was no longer issued except to a select few. While a new pattern of Service Dress was introduced for Other Ranks in this period, it was reserved for dress wear only. Battle Dress completely replaced SD as a field uniform beginning in 1940 as enough of the new uniforms became available. A new pattern of BD was introduced in 1949, with an open collar matching that of British Pattern 1949 BD. The garment was worn as a field dress throughout the Korean War, and into the 1960s until replaced by the Combat uniform. Some Militia units used BD as a dress uniform until the early 1970s. The US Army produced its own version of the BD blouse for issue to soldiers in Europe. Although most of these were produced in England, they were of a dark green color, rather than khaki. Called the ETO (European Theater of Operations) jacket, American soldiers dubbed it the Ike Jacket, after General Dwight D. Eisenhower. Bush Dress was a series of dark green cotton uniforms, similar to KD clothing, which replaced those uniforms just prior to the Korean War. Like KD, Bush Dress was worn primarily as a field uniform. It was replaced by the Combat uniform in the 1960s. The green combat uniform became universal battledress in the 1960s, and was designed to be worn in any environment (though a tan coloured "tropical" version was worn during Operation Desert Storm and by the Airborne in Somalia). The Canadian pattern combat uniform had angled pockets, designed to take magazines from the FN C1A1 battle rifle; a truly poor design of infantry load bearing equipment inspired this design – the 1964 Pattern Web Equipment had no ammunition pouches. The angled pockets are repeated on the new CADPAT uniform, though they are enlarged and not intended for ammunition carriage. The Canadian combat uniform had a high nylon content, which had the potential for producing significant burns. In Canada, battledress is referred to officially as "No. 5 Operational Dress", and in general parlance as "combat uniform" or "combats". The new Canadian Disruptive Pattern uniform is commonly called "CADPAT" to diffentiate it from the previous uniform called "combat" The term combat now refers to the old monochrome (single color) combat uniform. Currently, the Canadian Forces use the four-colour CADPAT design, a computer-generated pixelated pattern issued in TW (temperate woodland) and AR (arid region) colours. Camouflage cloth of CADPAT pattern was created and adopted in 1995, used for issue helmet covers in 1997 and trousers and blouses in CADPAT began to replace the olive green combat uniform from 2001 when Canadian forces joined the UN peacekeepers in Bosnia-Hercegovina. The AR version was introduced when Canadian troops were deployed to Afghanistan. Previously, a tan version of the olive combats had been used for tropical wear by soldiers deployed to the Middle East, particularly during Operation Desert Storm and were to be worn by the Canadian Airborne Regiment (Cdn Ab Regt) for the (subsequently canceled) deployment the Western Sahara in 1991. They were later worn by the Cdn Ab Regt during their deployment to Somalia. The TAN colored combat uniform was also issued to Canadian troops serving in the Western Sahara with the UN Mission (MINURSO) during 1992–1993. Until well into the post-World War II era, the Canadian Army had worn battle dress uniforms similar to their British and Commonwealth counterparts, though with different national identifiers and regimental accoutrements (with Khaki Drill uniforms being worn in the summer or in tropical regions). In the early 1950s, battle dress began to be replaced with lightweight uniforms, at first Bush Dress for summer wear, and in the 1960s with Combat Dress, a set of olive drab garments more similar to the American style of combat wear (i.e. made up of layers and solely for wear in the field as opposed to all-purpose wool Battle Dress). Specialised battledress was developed primarily during the Second World War, including the Denison smock – originally for parachutists but also adopted by snipers. Specialized jump clothing was perpetuated by the Canadian Airborne Regiment who wore distinctive disruptive-pattern jump smocks from 1975 until disbandment in 1995. Special patterns of AFV uniform were also worn beginning in the Second World War, initially black coveralls, later khaki coveralls as well as the padded "Pixie suit". Olive drab tanker's uniforms were adopted with the combat uniform in the 1960s, including a distinctive padded jacket with angled front zip. The Canadian Army has made extensive use of plain coveralls as a field uniform, commonly using khaki coveralls in the Second World War to save wear and tear on wool BD. In the 1950s and 1960, the Canadian military adopted black coveralls which were often worn as combat dress, replacing them in the 1970s with rifle green coveralls. These were worn in the field in Canada by units in training but are also evident in photos of men deployed to West Germany during the Cold War, as armoured and mechanized units sometimes preferred to wear coveralls when carrying out maintenance. From the middle of the 19th century until the end of the Second World War, French field uniforms for dismounted troops were based on a kind of universal long coat called the "capote" and breeches, both made of woollen serge. For infantry this greatcoat was worn buttoned back from the legs when on the march. Until the end of 1914 the "capote" was produced in dark blue and the breeches were in red. These highly visible uniforms were replaced in early 1915 by light blue/grey (bleu horizon) uniforms for metropolitan troops and khaki for colonial troops. In 1921, the French army decided to replace the horizon blue with khaki. Because of large surplus stocks built up during the war, this measure was not fully effective until 1937. However, during the Phoney War, some third-line troops were still equipped with bleu horizon uniforms. After the defeat, the French army went on wearing 1940 uniforms, in particular the "armée d'Afrique" (African army). Some new equipment was introduced by Vichy for the "armistice army" limited to 100 000 soldiers on French soil. The old French uniforms were progressively replaced in the Free French forces by much more modern British or American uniforms which were progressively withdrawn but still in use until the end of the fifties. The first French battledress was introduced in 1945 and was made of a heavy cotton duck, sometimes taken from old German stocks and based on the same design as the British 1937 pattern. The French army introduced a new woolen serge model in 1946 looking like the British 1937 pattern but with exposed buttons. Although it was intended to be a field uniform, it was mainly used as a winter walking-out uniform until the late 1950s. However, the "armée de l'air" used it in its dark blue version, until 2010. A proper cotton combat uniform was introduced in 1947 (Modèle 47) based on a jacket inspired by the US 1943 pattern and loose trousers with two big cargo pockets on each side of the thighs. The same year, a special uniform, also called "Modèle 47" was issued to airborne units composed of a large jacket with two breast and two hip cargo pockets. Originally, both "modèle 47" were issued in khaki. From 1951 on, the paratroopers' uniform and, in a lesser proportion, the standard Modèle 47 were issued in a three-colour camouflage pattern which gave the uniform the nickname tenue léopard (leopard uniform), but became better known as the TAP47 lizard pattern. It was issued in many colour variants (colourways) and saw war service in Indochina and in North-Africa, and were frequently copied by nations in those areas. The last official issue was the 1956 variant, but its use continued until the end of the war in Algeria. The "tenue léopard" was a symbol of elite units and was issued only to French Foreign Legion and French airborne units. Therefore, it was withdrawn in 1962, officially, to give a standard uniform to the whole of the French army, less officially, to punish those elite troops which had not behaved well during the conflict. The Modèle 1947 paratroopers uniform kept on being produced in grey-green material (water repellent and herringbone) until 1969 and was replaced by the Modèle 1964. On an other side, the camouflaged uniform was still in use by the French forces in overseas territories until the end or the 1980s. A huge quantity of them was handed over to Portugal and Israel. The French army received a new standard battle dress in 1964, roughly based on the principles of the 1947 pattern, but much closer to the body, with zipped breast pockets and made of water repellent grey-green infrared proof material called Satin 300 to protect soldiers against nuclear and chemical agents. Because of budget shortage at the beginning of the 1980, this uniform was made of much lighter but much more fragile herringbone material under the name F1. A new variant under the name F2 was introduced at the end of the eighties made of a much stronger material. F1 uniforms were mainly sent to overseas territories. In 1990, desert camouflage was introduced during the Gulf war and F2 battle dress were produced in a hurried effort in a three-colour "Daguet" desert pattern. Experimental FELIN pattern on a soldier in 2005. In the 1980s, research results were rejected, because of the similarity to German flecktarn. In 1992, a new four colour camouflage called "centre europe" and close to the American woodland pattern was presented and progressively introduced for troops in ex-Yugoslavia. F2 battle dress were produced in camouflaged water repellent or herringbone material from this instant on. The imperial German army adopted feldgrau ("field grey") in 1910. Nazi Germany funded a great deal of research on camouflage uniforms, investigating many patterns including NIR camouflage. After much trial the Oberkommando der Wehrmacht, in 1938, issued the basic four-colour "plane tree" pattern (Platanenmuster) of Schick and Schmid in the form of camouflage smocks to units of the Waffen SS. [dubious – discuss] The three-colour disruptive Splittermuster, more commonly known in English as 'splinter pattern', was issued to the army beginning before the war, in the form of camouflaged tent quarters (zeltbahn) which was reversible, with a splinter pattern in dark colours on one side, and light coloured on the other. From 1942, a year after the Luftwaffe started producing jump smocks in this pattern, a variety of helmet covers and camouflage smocks were adopted for the army. A distinctive variant of splinter pattern camouflage was introduced midway through the war, a blurry marsh pattern (Sumpfmuster) referred to as "tan water pattern" in English by collectors. During the war, additional SS variants including "palm", "smoke", and "oak leaf" were introduced, in spring and autumn colours. By 1944 the complex "peas" pattern (Erbsenmuster) was also used by the Waffen SS issued as standard, in tunic and trouser combinations, but never in smocks or caps. Initially, camouflage had been a sign of elite troops and the SS continued this differentiation by using its own distinctive patterns. In 1941, during the winter on the Eastern Front, German troops were at a considerable disadvantage because they lacked winter camouflage.In 1945, a five-colour Leibermuster design was introduced. Intended to be used by all the armed forces, it was layered to improve effectiveness at distance, used a new print method to reduce obvious repetition, and included NIR protection. Due to the distribution situation, it was issued to eastern units only. After WW2, this became the standard camouflage pattern for the Swiss armed forces. In the 1950s, West Germany's Bundeswehr used two versions of the wartime "splinter", a four-colour pattern called BV-Splittermuster. Thereaft, from 1961 until 1990 they used the so-called olive-green battle dress. Following various trials the dots-and-blotches five-colour Flecktarn pattern was chosen in 1976 and issued from the mid-1980s. Reserve forces' unit remained in old olive-green battle dress as late as 1994. East Germany's Nationale Volksarmee first pattern was the 1956 Russisches Tarnmuster based, as the name suggests, on the Soviet "amoeba" designs. It was soon replaced by the four-colour Flächentarnmuster pattern (sometimes called "potato" or "splotch"). In 1965, the dense straight-line two-colour Strichmuster pattern was introduced, sometimes called "ein Strich – kein Strich", it remained in use until reunification. Flecktarn was made the pattern for the unified country. The Italian Army used grigio-verde in the Alps from 1906 and across the army from 1909. In 1929, the country was the first to mass-produce camouflage fabric, the three-colour telo mimetico pattern. It was initially used as shelter halves, and not issued as uniform until 1942. The pattern remained in use after the war, moving through several colour variations. The marines adopted a complex five-colour "Mediterranean spray" pattern in the 1980s. In 1990, a new army pattern was introduced, a four-colour named "Vegetata"; a desert version was also issued from 1992. A mannequin showcasing the current camouflage pattern worn by the Japanese Self-Defense Forces. The Japanese tried monochrome green during the 1905 conflict with Russia, but entered World War II with monochrome mustard khaki uniforms. Some were fitted with special loops to aid the attachment of natural vegetation. The Japan Self-Defense Forces did not issue a pattern until the 1980s, choosing a four-colour green-and-brown design, sometimes called "fang". It was succeeded in 1991 by a dot pattern close to flecktarn, while during the Gulf War a six-colour pattern similar to the United States Desert Battle Dress Uniform was used. The Imperial Russian Army fought mostly in white or in dark green colours (introduced by Peter the Great in 1700), even if several regiments (Life Guards regiments, Cavalry Guards, Dragoons and Uhlans regiments) dressed in distinctive and colourful attire. Cossack regiments were reported to use basic camouflage patterns and techniques during the Crimean War. Duller colours were used unofficially in the 1880s and again in 1905. The whole army began using khaki from 1908 on. In the early 1930s, the Soviet Union developed one-piece coveralls and two-piece suits with a disruptive pattern of big amoeba-like spots, which, in conjunction with the baggy shape of the suit itself, were very effective in breaking the outline of the human silhouette. The two-piece suits were made to be worn over the uniform and gear, which could be accessed through the special slots (a design feature later employed by the Germans). The limited use of a two-colour disruptive "amoeba" pattern began in 1938. The "amoeba" remained in use until the 1950s. The Soviet Union issued all-white winter camouflage in 1938. During World War II, other designs were tried, including "leaf" (1940) and the jagged three-colour "TTsMKK" (1944). Most troops remained in a monochrome brown. Post-war Soviet camouflage remained a sign of elite units. A two-colour "sun-ray" pattern was used by paratroopers from 1969 and two- or three-colour versions were issued to Spetsnaz, KGB and MVD troops into the 1980s. 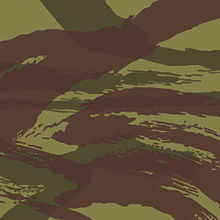 The KLMK pattern was the first "digital" camouflage and it was issued to Spetsnaz troops and some Border guards units. In the early 1980s a new brown and green pattern was introduced, the 3-TsV series, more commonly referred to as TTsKO. It was intended for the Soviet airborne and land forces, and remained in service until after the end of the Soviet Union. It was not seen by the west until 1985 during a military parade. After the collapse of the Soviet Union, a new pattern was developed as the standard field uniform. Issued from 1993, the three-colour green-brown-tan design in a vertical orientation was called VSR, or "Schofield" in the West. This was quickly superseded by the same basic pattern in a horizontal orientation, called 'flora', in 1998. Other widely used patterns in the 1990s were inspired by Western designs, notably the British DPM influenced the 'Smog' pattern, and U.S. Woodland pattern influenced the 'les' pattern. The elite forces maintain different patterns; MVD troops began using the four-colour "SMK" pattern in 1992 and other units wear a distinctive "reed" pattern. Versions of the "woodland" pattern also remain in use. From the late 17th century to the late 19th century, most British soldiers (red coats) fought in scarlet tunics. The adoption of scarlet was mainly for economic reasons. When Oliver Cromwell initially started forming the New Model Army, red was the cheapest dye available. Toward the end of the 19th century, however, as the nature of warfare moved away from close formation fighting to more individual fighting, it began to be recognised that this colour stood out too much. The move towards camouflage began in India, and khaki was used during the Indian rebellion of 1857. It became standard in India in 1885, for all foreign postings in 1896, and was adopted throughout the army in 1902 during the Second Boer War. Battle Dress (BD), later called "No.5 Dress", was the official name for the standard working and fighting uniform worn by the British Army and the armies of other Imperial and Commonwealth countries in temperate climes from 1937 to the late 1960s. It was a pair of trousers and a close fitting short jacket Blouse made of khaki-coloured woollen cloth. Air force blue battledress was worn by the Royal Air Force, and Royal Navy shore parties wore a navy blue version. Camouflage dress was hand-painted for some specialists. The Battle Dress design at the start of the war was the (19)37 Pattern. In 1940 it was replaced with the simpler made (19)40 Utility Pattern. This omitted finer details such as pleating on pockets. In both cases the blouse came in two forms, the ordinary ranks with closed neck and the officers open neck which exposed their shirt and tie. From 1942, the camouflaged Denison smock, originally issued to the Airborne forces to be worn over the BD, was issued more widely. In the early campaigns in North Africa and the Mediterranean theatre, British troops wore khaki drill (KD) shorts or slacks with long sleeved Aertex shirts. The paler shade of KD was more suited to desert or semi-desert regions than the dark khaki serge used in Battle dress. When the Allies moved up through Italy, however, two-piece khaki denim battledress overalls were increasingly preferred. By 1943, the KD shirt began to be replaced by a more durable cotton KD bush jacket. In the Far East, the British found themselves at war with the Japanese while equipped with the impractical KD uniform. Shirts and trousers had to be dyed green as a temporary expedient until more suitable jungle clothing became available. A new tropical uniform in Jungle Green (JG) was quickly developed – a JG Aertex battledress blouse, a JG Aertex bush jacket (as an alternative to the blouse) and battledress trousers in JG cotton drill. In the hot and humid conditions of Southeast Asia, JG darkened with sweat almost immediately. When the war in Europe was over, a new jungle uniform began to be produced for troops posted to the Far East. It was based on the U.S. Army Pacific theatre field uniform, with Aertex being rejected in favour of cotton drill. Although the jacket was similar to the U.S. design, the trousers maintained the battledress design, but with some features copied from American olive drab (OD) herringbone twill trousers. Newly available synthetic materials were utilised in one version of the new Olive Green (OG) uniform, as it was called. The khaki Battledress was used until the late 1960s, and various uniform items in KD, JG and OG remained on issue to soldiers serving in the Mediterranean, Middle East or tropics after the war. By the end of the 1940s, however, stocks were becoming depleted, and a new 1950-pattern tropical uniform was made available in both KD. Shorts were worn with a bush jacket. Eventually the much more practical Gurkha regiments’ JG shirt was copied, replacing the 1950-pattern bush jacket. All the same, troops still sought out the older, wartime, issues of the better KD, JG and OG kit. While serving during the Korean War (1950–53), troops had found the existing combat uniform inadequate: It was too hot in the summertime, and not warm enough during the harsh Korean winters. Soldiers were at first issued JG for hot weather, and battledress in the wintertime, but this had to be augmented with additional warm clothing (often from the U.S. Army) as well as caps with ear flaps and fur linings. A solution was rapidly pursued, and towards the end of the Korean War a windproof and water-repellent gabardine combat uniform was issued. The trousers followed the tried and tested battledress design, while the bush jacket had several pockets inside and out, closing with zips and buttons, a hip length skirt with draw-strings to keep out the wind, and a similar arrangement at the waist. The uniform was produced in a greyish green colour (OG), similar to the U.S. Army OD. With the end of National Service conscription in 1961, the Army looked for a new uniform: Something that was smarter than battledress, but also more comfortable, while still having a military air about it. Using the Korean War combat clothing as a basis, various new items of field wear were developed for the 1960-pattern Combat Dress, including the so-called Canadian pattern combat jacket, which was well made, with a lining above the waist and reinforced elbows. The 1960s was a period of transition for the Army, and this was reflected in the changes that were taking place in soldier's uniform. Formally classified as "No. 5 Dress", the 1949 pattern battledress began to be withdrawn from British Army use from 1961 on. With the general issue of the new service dress uniform for parade and off-duty ('walking out") wear, battledress was relegated to barracks wear from about 1962 and thereafter disappeared within individual units as stocks were used up. One final appearance was in Northern Island as a cold weather dress by the Gloucestershire Regiment in the winter of 1970. DPM Smock Windproof and trousers, temperate pattern. The new, smaller, all-volunteer Army could also now afford to equip every soldier with his own camouflaged uniform, and following work at the Army Personnel Research Establishment (APRE) a four-colour camouflage pattern was designed in 1960. From 1969 it was issued in limited quantities on 1960-pattern jackets and trousers. Known as “Pattern 1960 DPM” (Disruptive Pattern Material), these items were soon superseded by the '68-Pattern, which had a very slightly revised camouflage design on a new uniform, featuring minor changes over the preceding 1960/66-Pattern kit, most notably: a full lining for jacket and trousers. It became official issue only in 1972. The temperate clothing was followed by a DPM jungle combat uniform which, due to the use of different (i.e. polycotton) material, had a slightly different colourway. The underlying pattern has remained through various different patterns of clothing but has differed in detail of the pattern and the colourway depending on the material and manufacturer. The DPM uniform was overhauled with the introduction of the Combat Soldier 95 system in the mid 90s, which combined lightweight polycotton shirts and trousers similar to the old jungle uniforms with a combat jacket and breathable waterproof clothing. Prior to the Gulf War, the stock of uniform in four-colour desert DPM of browns and tans had been sold to Iraq therefore a two-colour DPM version (light brown on tan) was issued to UK forces. Since 2010 the British army began phasing out DPM in favour of MTP (Multi-Terrain Pattern). This Pattern is based on the technology developed by Crye called Multicam, which was rejected by the US Army in favour of the controversial ACU, but kept elements of the DPM pattern to create a more British army look. MTP was brought in as a response to the Green Zone in Helmad, Afghanistan, where troops could move between typical desert conditions like those found in Iraq to lush green countryside during a routine patrol. DDPM will remain in service alongside MTP. The initial run of DPM was produced in S95 cut and material, but the second run was produced closer to that used in the American ACU. See US Army Combat Uniforms in World War II, OG107, Battle dress uniform, Airman Battle Uniform, Army combat uniform, Navy Working Uniform & Marine Corps Combat Utility Uniform. ^ Barthorp, Michael (1988). The British Army on Campaign 1816–1902: Volume 3 (1856–1881). Osprey. pp. 24–37. ISBN 0-85045-835-8. ^ Borsarello, J.F. (1999). Camouflage uniforms of European and NATO armies : 1945 to the present (1.udg. ed.). Atglen, PA: Schiffer Pub. ISBN 0764310186. ^ Jouineau, Andre. Officers and Soldiers of the French Army in 1914. p. 14. ISBN 978-2-35250-104-6. ^ Jouineau, Andre. Officers and Soldiers of the French Army 1918. pp. 4 and 8. ISBN 978-2-35250-105-3. ^ Jouineau, Andre. Officers and Soldiers of the French Army 1940. p. 4. ISBN 978-2-35250-179-4. ^ Gaujac, Paul. Officiers et Soldats de L' Armee Francaise 1943-1956. pp. 88–89. ISBN 978-2-35250-195-4. ^ a b c Burns, Michael G. (1992). British Combat Dress Since 1945. Arms & Armour Press. ISBN 0-85368-984-9. ^ Jewell, Brian. British Battledress 1937-61. pp. 11–12. ISBN 0 85045 387 9. This page was last edited on 24 April 2019, at 20:08 (UTC).